Matrix management is a technique of managing an organization (or, more commonly, part of an organization) through a series of dual-reporting relationships instead of a more traditional linear management structure. In contrast to most other organizational structures, which arrange managers and employees by function or product, matrix management combines functional and product departments in a dual authority system. In its simplest form, a matrix configuration may be known as a cross-functional work team, which brings together individuals who report to different parts of the company in order to complete a particular project or task. The term "matrix" is derived from the representative diagram of a matrix management system, which resembles a rectangular array or grid of functions and product/project groups. The practice is most associated with highly collaborative and complex projects, such as building aircraft, but is also widely used in many product/project management situations. Even when a company does not label its structure a matrix system or represent it as such on an organization chart, there may be an implicit matrix structure any time employees are grouped into work teams (this does not normally include committees, task forces, and the like) that are headed by someone other than their primary supervisor. In the late 1800s and early 1900s, during the U.S. industrial revolution, a need emerged for more formalized structures in large business organizations. The earliest models emphasized efficiency of process through managerial control. Described as "mechanistic," those systems were characterized by extensive rules and procedures, centralized authority, and an acute division of labor. They sought to create organizations that mimicked machines, and usually departmentalized workers by function, such as finance and production. Important theories during that era included German sociologist Max Weber's (1881-1961) ideal bureaucracy, which was based on absolute authority, logic, and order. During the 1920s and 1930s, new ideas about the structure and nature of organizations began to surface. Inspired by the work of thinkers and behaviorists such as Harvard researcher Elton Mayo, who conducted the famed Hawthorne Experiments, theories about management structure began to incorporate a more humanistic view. Those theoretical organizational structures were classified as "organic," and recognized the importance of human behavior and cultural influences in organizations. While the mechanistic school of thought stressed efficiency and production through control, organic models emphasized flexibility and adaptability through employee empowerment. From a structural standpoint, mechanistic organizations tended to be vertical or hierarchical with decisions flowing down through several channels. Organic models, on the other hand, were comparatively flat, or horizontal, and had few managerial levels or centralized controls. Many proponents of organic organizational theory believed it was the solution to the drawbacks of mechanistic organizations. Indeed, mechanistic organizations often stifled human creativity and motivation and were generally insensitive to external influences, such as shifting markets or consumer needs. In contrast, companies that used organic management structures tended to be more responsive and creative. However, many organizations that adopted the organic approach also discovered that, among other drawbacks, it sometimes lacked efficiency and personal accountability and failed to make the most productive use of some workers' expertise. As an alternative to basic organic structures, many companies during the mid-1900s embraced a model that minimized the faults and maximized the benefits of different organic management structures, as discussed below. Possibly the first application of what would later be referred to as the "matrix" structure was employed in 1947 by General Chemicals in its engineering department. In the early 1960s a more formalized matrix method called "unit management" was implemented by a large number of U.S. hospitals. Not until 1965, however, was matrix management formally recognized. The first organization to design and implement a formal matrix structure was the National Aeronautics and Space Administration (NASA). NASA developed a matrix management system for its space program because it needed to simultaneously emphasize several different functions and projects, none of which could be stressed at the expense of another. It found that traditional management structures were too bureaucratic, hierarchical, slow-moving, and inflexible. Likewise, basic organic structures were too departmentalized (i.e. myopic), thus failing to productively use the far-reaching expertise NASA had at its disposal. NASA's matrix solution overcame those problems by synthesizing projects, such as designing a rocket booster, with organizational functions, such as staffing and finance. Despite doubts about its effectiveness in many applications, matrix management gained broad acceptance in the corporate world during the 1970s, eventually achieving fad status. Its popularity continued during the 1980s as a result of economic changes in the United States, which included slowing domestic market growth and increasing foreign competition. Those changes forced many companies to seek the benefits offered by the matrix model. Most organizational structures departmentalize the work force and other resources by one of two methods: by products or by functions. Functional organizations are segmented by key functions. For example, activities related to production, marketing, and finance might be grouped into three respective divisions. Within each division, moreover, activities would be departmentalized into subdepartments. The marketing division, for example, might encompass sales, advertising, and promotion departments. The chief advantage of functionally structured organizations is that they usually achieve a fairly efficient specialization of labor and are relatively easy for employees to comprehend. In addition, functional structures reduce duplication of work because responsibilities are clearly defined on a company-wide basis. However, functional division often causes departments to become short-sighted and provincial, leading to incompatible work styles and poor communication. Companies that employ a product or divisional structure, by contrast, break the organization down into semiautonomous units and profit centers based on activities, or "projects," such as products, customers, or geography. Regardless of the project used to segment the company, each unit operates as a separate business. For example, a company might be broken down into southern, western, and eastern divisions. Or, it might create separate divisions for consumer, industrial, and institutional products. Again, within each product unit are subdivisions. One benefit of product or project departmentalization is that it facilitates expansion (because the company can easily add a new division to focus on a new profit opportunity without having to significantly alter existing systems). In addition, accountability is increased because divisional performance can be measured more easily. Furthermore, divisional structures permit decentralized decision making, which allows managers with specific expertise to make key decisions in their area. The potential drawbacks to divisional structures include duplication of efforts in different departments and a lack of horizontal communication. In addition, divisional organizations, like functionally structured companies, may have trouble keeping all departments focused on an overall company goal. Matrix management structures combine functional and product departmentalization. They simultaneously organize part of a company along product or project lines and part of it around functional lines to get the advantages of both. For example, a diagram of a matrix model might show divisions, such as different product groups, along the top of a table (See Figure 1). Along the left side of the same table would be different functional departments, such as finance, marketing, and production. Within the matrix, each of the product groups would intersect with each of the functional groups, signifying a direct relationship between product teams and administrative divisions. In other words, each team of people assigned to manage a product group might have an individual(s) who also belonged to each of the functional departments, and vice-versa. Theoretically, managers of project groups and managers of functional groups have roughly equal authority within the company. As indicated by the matrix, many employees report to at least two managers. For instance, a member of the accounting department might be assigned to work with the consumer products division, and would report to managers of both departments. Generally, however, managers of functional areas and divisions report to a single authority, such as a president or vice president. Although all matrix structures entail some form of dual authority and multidisciplinary grouping, there are several variations. For example, Kenneth Knight identified three basic matrix management models: coordination, overlay, and secondment. Each of the models can be implemented in various forms that differ in attributes related to decision-making roles, relationships with outside suppliers and buyers, and other factors. Organizations choose different models based on such factors as competitive environments, industries, education and maturity level of the workforce, and existing corporate culture. In the coordination model, staff members remains part of their original departments (or the departments they would most likely belong to under a functional or product structure). Procedures are instituted to ensure cross-departmental cooperation and interaction towards the achievement of extra-departmental goals. In the overlay model, staff members officially become members of two groups, each of which has a separate manager. This model represents the undiluted matrix form described above. In the third version, the secondment model, individuals move from functional departments into project groups and back again, but may effectively belong to one or the other at different times. As these examples and models suggest, matrix structures are more likely than other structures to exist on a temporary or ad hoc basis. Indeed, some scholars group matrix structures under a broader category of organizational forms called "adhocracies," or temporary work configurations, created to deal with a particular problem or project. Large-scale use of adhocracies dates to U.S. military practices during World War II, when the war effort required flexible teams of experts to be convened on short notice and delegated certain tasks, often without a great deal of micromanagement by military brass. Once the objectives were reached, the team would be disbanded and the members reassigned to other duties. A similar rationale and process exist in the business world, and thus many formal matrix structures fall into the ad hoc category. 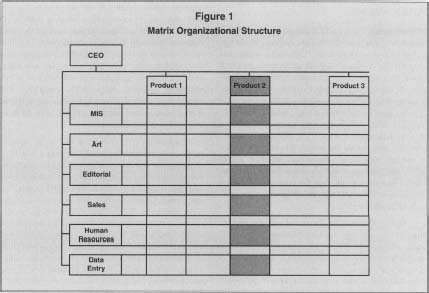 Permanent matrix structures are centered on more enduring aspects of business operations, such as product lines or processes. A common practice is to have a product or brand manager who is responsible for overseeing the development and production of an ongoing product, but staff who work on the product may also contribute to other products from time to time. This permanent set-up creates accountability, coordination, and perhaps most of all, continuity for the product as a whole, while enabling staff, who generally have a direct supervisor who is not a product manager, to be flexibly assigned where they are needed most. The cardinal advantage of a matrix structure is that it facilitates rapid response to change in two or more environments. For instance, a telecommunications company might be extremely concerned about both unforeseen geographic opportunities and limited capital. By departmentalizing its company with the financial function on one axis and the geographic areas on the other, it might benefit from having each of its geographic units intertwined with its finance department. For example, suppose that an opportunity to purchase the cellular telephone rights for a specific area arose. The matrix structure would allow the company to quickly determine if it had the capital necessary to purchase the license and develop the area, or if it should take advantage of an opportunity in another region. Matrix structures are flatter and more responsive than other types of structures because they permit more efficient exchanges of information. Because people from different departments are cooperating so closely, they are eager to share data that will help them achieve common goals. In effect, the entire organization becomes an information web; data is channeled both vertically and horizontally as people exchange technical knowledge, marketing data, product ideas, financial information to make decisions. In addition to speed and flexibility, matrix organization may result in a more efficient use of resources than other organic structures. This occurs because highly specialized employees and equipment are shared by departments. For example, if the expertise of a computer programmer is needed in another department, he or she can move to that department to solve its problems, rather than languishing on tasks of low priority as might happen in a nonmatrix setting. Other benefits of matrix management include improved motivation and more adept managers. Improved motivation results from decision-making within groups becoming more democratic and participatory because each member brings specialized knowledge to the table—and since employees have a direct impact on day-to-day decisions, they are more likely to experience higher levels of motivation and commitment to the goals of the departments to which they belong. More adept management is the result of top decision makers becoming more involved in, and thus better informed about, the day-to-day operations of the company. This involvement can also lead to improved long-term planning. Despite their many theoretical advantages, matrix management structures have been criticized as having a number of weaknesses. For instance, they are typically expensive to maintain, partly because of more complex reporting requirements. In addition, many workers become disturbed by the lack of a chain of command and a seeming inability to perceive who is in charge. Indeed, among the most common criticisms of matrix management is that it results in role ambiguity and conflict. For instance, a functional manager may tell a subordinate one thing, and then a product/project boss will tell him or her something different. As a result, companies that change from a comparatively bureaucratic structure to matrix management often experience high turnover and worker dissatisfaction. Supporting critics' derision of matrix management are several examples of companies that have implemented and later abandoned matrix structures. For example, one study showed that between 1961 and 1978 about one-quarter of all teaching hospitals in the United States moved to unit or matrix management structures. By the late 1970s, though, nearly one-third of those hospitals had rejected the concept, citing reasons such as high costs, excessive turnover, and interpersonal conflict. Although the hospital study suggested that matrix management was better suited to larger organizations, General Motors Corp.'s experience indicated otherwise. After a seven-year test of a matrix structure, GM jettisoned matrix management in the 1980s in favor of a more traditional, product oriented organizational structure. It cited managers' lack of control over incentives as a primary shortcoming of the matrix system. Although matrix management was often viewed during the 1970s as a cure-all for organizational design, the perceived breadth of its potential for application has gradually diminished. In general, matrix structures are assumed to be most appropriate for larger corporations that operate in unique or fast-paced environments; a coal-mining company, for example, might be less likely to benefit from a matrix structure than would a pharmaceutical company. Matrix management also works best for organizations that are managed and staffed mostly by professionals or semi-professionals, e.g., engineers and scientists. Matrix management further requires a workforce that has a diverse set of skills and employees that have strong interpersonal abilities. Finally, matrix management is usually more effective when a project manager, who is technically working under the authority of a product and a functional boss, is given the authority to make critical decisions. Because of their limitations, matrix management structures frequently are integrated into an organization as one facet of a larger plan. For example, a research team organized to develop a new product might be placed in a division of the company that is set up as a matrix. After the initial stages of the project are completed, the ongoing management of the product might be moved to a division of the company that reflects a more conventional functional or product/project structure. Indeed, as evidenced by NASA's successes in the 1960s, matrix management is particularly effective in accomplishing "crash" and high-tech projects, such as those related to medical, energy research, aerospace, defense, and competitive threats. A special and popular application of matrix management is in the overseas operations of an international firm. This is sometimes known as a three dimensional matrix when management intersects along product/market, function, and country lines. Under such an arrangement there is typically a worldwide product manager, a local or worldwide functional manager, and a country specific manager; however, many variations of the international matrix exist. The product manager is generally concerned with product-specific issues that cut across regional or national boundaries. Depending on the type of task and the company's preference, the functional manager may focus on international issues (e.g., worldwide finance) or local concerns (e.g., domestic finance). Finally, the country manager is concerned with all the implications—both product and function—of producing and/or marketing the goods or services in a particular locale. As with other uses of the matrix structure, the international format is not without its weaknesses. A particular concern is the role of ambiguity across international lines, and especially when it pits managers of different nationalities against one another. If the system is not handled carefully and the potential for cultural bias recognized by top management, it could lead to favoritism of some international managers while disenfranchising others, thereby defeating the purpose of a matrix structure. In addition, international matrix structures may be unacceptably inefficient and costly to maintain. Bayer AG of Germany—the company best known in the United States for its Bayer aspirin products—is one of the largest and oldest chemical and health-care products companies in the world. Because of massive sales gains and increased activity overseas in the early 1980s, Bayer announced a reorganization in 1984. Bayer had been successful with a conventional organizational structure that was departmentalized by function. However, in response to new conditions the company wanted to create a structure that would allow it to achieve three primary goals: (1) shift management control from the then-West German parent company to its foreign divisions and subsidiaries; (2) restructure its business divisions to more clearly define their duties; and (3) flatten the organization, or empower lower level managers to assume more responsibility, so that top executives would have more time to plan strategy. Bayer selected a relatively diverse matrix management format to pursue its goals. It delineated all of its business activities into six groups under an umbrella company called Bayer World. Within each of the six groups were several subgroups made up of product categories such as dyestuffs, fibers, or chemicals. Likewise, each of its administrative and service functions were regrouped under Bayer World into one of several functions, such as human resources, marketing, plant administration, or finance. Furthermore, top managers who had formally headed functional groups were given authority over separate geographic regions, which, like the product groups, were supported by and entwined with the functional groups. The net effect of the reorganization was that the original nine functional departments were broken down into 19 multidisciplinary, interconnected business groups. After only one year of operation, Bayer management lauded the new matrix structure as a resounding success. Not only did matrix management allow the company to move toward its primary goals, but it had the added benefits of increasing its responsiveness to change and emerging opportunities, and of helping Bayer to streamline plant administration and service division activities. Burton, Richard M., and B0rge Obel. Strategic Organizational Diagnosis and Design. 2nd ed. Boston: Kluwer Academic Publishers, 1998. Knight, Kenneth, ed. Matrix Management: A Cross-Functional Approach to Organization. New York: PBI-Petrocelli Books, 1977. Kramer, Robert J. Organizing for Global Competitiveness: The Matrix Design. New York: Conference Board, 1994. Nissan, David. "A Regional Slice of the Global Pie." Financial Times, 14 August 1995. Tailan Chi, and Paul Nystrom. "An Economic Analysis of Matrix Structure, Using Multinational Corporations as an Illustration." Managerial & Decision Economics, May 1998. Very helpful and clear. Needed a quick tutorial and this did the job. Thanks. There are not any examples for each kind of sturctures. A little dispointed. Employees within the functional divisions of an organization tend to perform a specialized set of tasks, for instance the engineering department would be staffed only with software engineers. This leads to operational efficiencies within that group. However it could also lead to a lack of communication between the functional groups within an organization, making the organization slow and inflexible.